1Centro Nacional de Investigaciones de Café, Cenicafé. Colombia. 2Universidad Nacional de Colombia - Sede Medellín. Facultad de Ciencias Agrarias. Departamento de Ciencias Agronómicas. Colombia. 3Yara GmbH & Co.KG Germany. Coffee cultivation depends on water supplied by rain or irrigation, which, in turn, affect productivity and harvest distribution. Knowing the influence of plant spacing on the behavior of soil moisture and water consumption, is likely to determine a crop’s planting density, fertilization and planting times, all based on regional water availability. 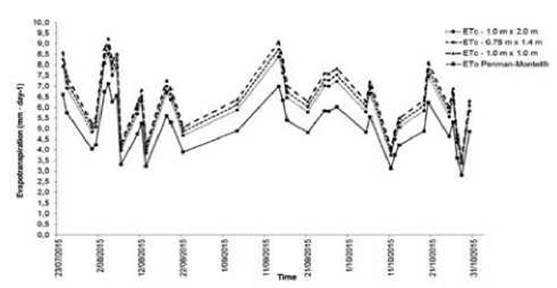 In this context, the study was conducted at Naranjal Experimental Station, municipality of Chinchiná (Caldas, Colombia) at 04° 58’ N, 75° 39’ W; 1,381 m a.s.l., aimed to describe moisture performance in a coffee plantation established on an Andisol, under three planting densities. This was done by estimating the evapotranspiration (ETo) and assessing crop evapotranspiration (ETc). Soil moisture was measured with a capacitance probe equipped with sensors spaced at 10, 20, 30, 40, 60 and 100 cm. Moisture content in the soil profile varied with planting density and from dry to humid periods. ETo and ETc were observed to be influenced by weather conditions, which determined higher values during the dry season and lower ones in the rainy season. Although planting density was found to affect hydraulic soil properties, sufficient water supply for the plants along both humid and dry seasons was stabilized by the water storage capacity that characterizes Andisols. The capacitance probe constitutes an effective tool for studying water performance in soils with coffee vocation in Colombia, especially when they are sensitive to the limitations imposed by water deficit resulting, in turn, from current or future climate variability. El café es un cultivo dependiente del agua disponible en el suelo, bien sea a través de la lluvia o del riego, ya que ésta tiene un marcado efecto en la productividad y la distribución de la cosecha. Conocer el efecto de la distancia entre plantas sobre el comportamiento de la humedad en el suelo y el consumo de agua, influye en las prácticas agronómicas del sistema productivo del café, entre ellas: la densidad de siembra, la fertilización, y las épocas de siembra. El estudio se realizó en la Estación Experimental Naranjal ubicada en Chinchiná (Caldas, Colombia) a 04° 58’ N, 75° 39’ O; 1,381 m de altitud y tuvo como objetivos conocer el comportamiento de la humedad en un Andisol sembrado con café en tres densidades de siembra, estimar la evapotranspiración de referencia (ETo) y evaluar la evapotranspiración del cultivo (ETc). La humedad del suelo se midió con una sonda de capacitancia de 100 cm con sensores espaciados cada 10 cm. La humedad en el perfil del suelo varió con la densidad de siembra y entre los periodos secos y húmedos considerados. La ETo y la ETc fueron influenciadas por las condiciones de clima, siendo mayores en la época seca y menores en la época de lluvias. La densidad de siembra afectó las propiedades hidráulicas del suelo. No obstante, por la capacidad de almacenar agua que caracteriza a los Andisoles, las plantas tuvieron agua disponible aún en las épocas secas. La sonda de capacitancia mostró ser un instrumento efectivo para el estudio del comportamiento del agua en los suelos de la región cafetera de Colombia, especialmente aquellos sensibles a las limitaciones ocasionadas por el déficit hídrico como producto de la variabilidad climática actual y futura. Colombia is considered to be the third largest coffee (Coffea arabica L.) producer in the world, with 945,679 ha of cultivated land (Federación Nacional de Cafeteros, 2015), mostly without supplementary irrigation. For such reason, coffee is highly dependent on rainfall distribution, which certainly limits the management of the crop. In some regions of Colombia, and under normal precipitation conditions, there are more than two consecutive dry months, which, under events of climate variability such as ‘El Niño’, may reduce water availability for cultivation (International Trade Centre, 2010). In turn, other regions are characterized by 12 rainy months, phenomena like ‘La Niña’ determining such high levels of soil moisture that crop productivity is hindered (Peña-Quiñones, Valencia-Arbeláez and Ramírez- Carabalí, 2014). Therefore, understanding the influence of plant spatial arrangement on the behavior of soil moisture and water consumption by cultivated plant species is of central importance, all the more since it makes it possible to define strategies to facilitate the adaptation of plantations to prevailing climate limitations. Coffee planted soils are diverse, many of them being derived from volcanic ashes or Andisols (Hincapié, 2011; González, 2013), while others result from sedimentary and/or metamorphic rocks. Andisols possess physical, chemical and mechanical properties of great importance for cultivation, due to their elevated moisture retention capacity and productive potential, organic carbon accumulation and nitrogen fixation rates (Shoji and Takahashi, 2004; Tobón et al., 2010). On the other hand, factors such as porosity, aggregate structure, texture, bulk density, real density and organic matter content, which have a major influence on water dynamics along the soil profile (Rawls, Pachepsky, Ritchie, Sobecki, and Bloodworth, 2003; Kodesová et al., 2011), make soils resulting from sedimentary and metamorphic materials more vulnerable to water deficit conditions. Therefore, these soils do not provide for long lasting crop water demands (Ramírez, 2014). Water deficiency or excess affect physiological and biochemical processes in plants (Farooq et al., 2008; Jaleel, Manivannan, Lakshmanan, Gomathinayagam and Panneerselvam, 2008; Yooyongwech, Theerawitaya, Samphumphuang and Cha-Um, 2013). Water deficiency causes partial stomatal closure, decreases cell water potential and reduces the amount and availability of energy and metabolites that are necessary for the full growth and expression of crop productive potential (Kulkarni and Phalke, 2009). In turn, excessive moisture decreases oxygen levels (thus preventing root respiration), produces toxic substances such as ethanol and hydrogen sulfide, and exposes the plants to attack by microorganisms. Prolonged exposure to the indicated adverse conditions may cause plant death (Jaleel et al., 2008; Kirnak, Kaya, Higgs and Gercek, 2001; Sharkey and Schrader, 2006; Sigua, Williams, Grabowski, Chase and Kongchum, 2012). In the case of coffee plant, there is evidence that both water deficit and excess reduce photosynthesis (Da Matta and Ramalho, 2006). Some perennial plants extend their root systems deep into the soil, seeking water when it is not sufficiently available in the upper region of the profile, or when soil moisture is below field capacity, thus causing increased evapotranspiration and decreased deep drainage (Eilers, Carter, and Rushton, 2007). On the other hand, anoxic soil conditions promote ethylene and abscisic-acid- mediated root responses aimed at reducing loss of oxygen and facilitating the formation of roots that are capable of capturing it through specialized (aerenchymatic) tissues (Erb and Lu, 2013). Climate conditions affect crop water demand, which is met by the available moisture reservoir of the soil. Under these conditions, the cumulative effects of water deficiency or excess can reduce crop final biomass and productivity (Hsiao, 1993; Jamieson, Martin, Francis and Wilson, 1995). Soil moisture is determined by meteorological factors such as temperature, precipitation (Thomas, 2000), solar radiation balance and vapor pressure deficit (VPD) (Angelocci, Marín, Pilau, Righi, and Favarin, 2008; Ramírez, Mejía, Marín, and Arango, 2011). The two latter factors contribute to determining the evapotranspiration demand, which, at the physiological level is defined by Leaf Area Index (LAI) and root depth. The mentioned components make up the soil-plant-atmosphere system, which combines both evaporation and plant transpiration mediated water losses from the soil (Burman and Pochov, 1994). At this point, hydric balance is one of the ways to calculate actual crop evapotranspiration (ETc) and loss of water from the soil-plant-atmosphere system (Lubana, Narda, and Thaman, 2001; Evett, Tolk, and Howell, 2006). Coffee planning tasks such as the scheduling of planting dates, fertilization programs, weed management, phytosanitary controls and the renovation of plantations, are entirely dependent on water intake, be it obtained from rainfall or irrigation. Just as well, the magnitude and distribution of flowering and bean production depend on such water inputs (Ramírez, Jaramillo, and Arcila, 2010). During the dry season, the fruit does not fully develop and its growth rate is hindered; in turn, abundant rainfall caps both plant growth and floral differentiation, which directly affects productivity (Turbay, Nates, Jaramillo, Vélez, and Ocampo, 2014; Valencia, 1999). Some research has already been conducted on the effect of soil moisture on photosynthesis (Da Matta and Ramalho, 2006) and flowering (Arcila and Jaramillo, 2003) in this crop. Studies on shaded coffee have shown that soil moisture in the top 5 cm layer is higher than at 15 cm deep due to reduced evaporation. However, water absorption and transpiration in deeper layers determine even higher hydric losses (Sylvain, 1959). In contrasting free exposure and agroforestry coffee systems planted in the same site, Jaramillo and Chaves (1999) found differences on the behavior of soil moisture at the same depth. Likewise, Farfán and Jaramillo (2008) observed differences in soil moisture content at 20 cm deep in two contrasting agroforestry system areas, one of which exhibited soil water deficit. However, regarding free exposure coffee systems in Colombia, there are no reports on soil moisture contents under different spatial arrangements at the same planting site. The soil-plant-atmosphere relation in Colombian coffee crops has not been explored in deep. Moreover, there is little knowledge about the way in which soil water dynamics is conditioned by plant physiology, planting density and planting system. Just as well, there is meager knowledge about the influence of the atmosphere as the factor that actually propels the system. Therefore, the present study aimed to describe the behavior of volumetric soil moisture under three different spatial arrangements in the same coffee plantation. This was done by estimating the differences in volumetric soil moisture along the soil profile, and by calculating crop evapotranspiration (ETc) and reference evapotranspiration (ETo) in each of them. The study was conducted at Naranjal Experimental Station, municipality of Chinchiná (Caldas, Colombia) at 04° 58’ N, 75° 39’ W; 1,381 m a.s.l., average temperature 20.9 °C, minimum 16.6 °C and 26.8 °C maximum; relative humidity 76.9, annual radiation 1,671 hours and 2,795 mm, located in the colombian coffee zone. Three 40-month-old coffee plots of the variety Castillo® (planted in July, 2012) were selected for the trial. The different spatial arrangements of these plots determined contrasting distances between plants and rows, respectively, as follows: 1.0 m x 2.0 m (two productive stems [A]); 0.75 m x 1.40 m (one productive stem [B]); and 1.0 m x 1.0 m (one productive stem [C]). Each plot covered an area of 1,000 m2. The recording was carried out with a capacitance probe at three monitoring points for each planting density. Measurements were taken from three monitoring points for each planting density, making use of a PR2 Profile Probe System (Delta-T devices - Data sheet®). Equipped with sensors spaced at 10, 20, 30, 40, 60 and 100 cm, the instrument is 100 cm long. Its sensors emit electromagnetic fields that extend into the soil, covering a radius of about 10 cm. Within this area the sensors measure soil dielectric permittivity, which is then transformed to soil moisture. These measurements were preceded by the installation of access tubes in the soil around the plant, thus allowing the maximization of electromagnetic field penetration. These access tubes were vertically buried into the soil (50 cm deep) at a horizontal distance of 50 cm from the base of the plant, heading west (Point 1) and east (Point 2) (Figure 1). Moisture volumetric content was measured along the profile at 10, 20, 30, 40 and 50 cm deep every day at 6:00 am and 5:00 pm from July 13 to November 30 of 2015. Moisture volumetric content was determined in cm3 of water per cm3 of soil (cm3 cm-3) and expressed in percent data (%). Figure 1 Schematic diagram of the method employed in the field to monitor the volumetric soil moisture profile around a coffee plant. Bulk density (g cm-3) was determined by the short-cylinder method (Grossman and Reinsch, 2002). For this purpose, stainless steel rings (5 cm long and 5 cm diameter) were employed to take 10 unaltered soil samples. In the laboratory, the soil contained in each cylinder was extracted and weighed, and then oven-dried at 105 °C until reaching constant weight. Bulk density (BD) was calculated through equation 1.
where: BD = bulk density, Ws = weight (g) of 105 °C-dried soil contained in the cylinder, Vs = volume soil contained in the cylinder (cm3). Real density (g cm-3) was determined with the pycnometer method (Blake and Hartge, 1986). Air dried soil samples were passed through a 500 micron (No. 35) sieve. Real density (RD) was calculated through equation 2.
where: RD = real density, Mds = dry soil mass (g), Vds = dry soil volume (cm3). Porosity was calculated through equation 3 as the ratio between bulk density and real density (Klute, 1986). where: q = total porosity, BD = bulk density, RD = real density. Reference evapotranspiration (ETo) and crop evapotranspiration (ETc). 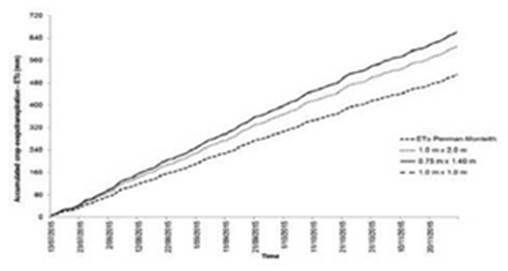 ETo (mm day-1) was calculated through the Penman-Monteith equation (Allen, Pereira, Raes, and Smith, 1998). Climate data were obtained from a remote automatic weather station (RAWS-F Campbell Scientific®) installed at Naranjal Experimental Station. At 5 min intervals, the equipment recorded average, maximum and minimum ambient temperatures, leaf and soil temperatures, precipitation, net solar radiation, photosynthetically active radiation, relative humidity, soil moisture, wind speed and atmospheric pressure. Reference evapotranspiration (ETo) was calculated through equation 4.
where: R n = net radiation on the crop’s surface (MJ m-2 d-1), G = sensible heat flux (MJ m-2 d-1), T = daily mean air temperature (°C), u 2 = wind speed at 2 m height (m s-1), e s = saturation vapor pressure (kPa), e a = actual steam pressure (kPa), A = slope of the vapor pressure curve (kPa °C-1), Y = air psychrometric constant (0.0642 kPa °C-1). where: ET c = crop evapotranspiration (mm day-1), ET o = reference evapotranspiration (mm day-1), K c = crop constant. The crop constant (Kc) depends on the phenological stage and planting density of the crop. For coffee crops older than 3 years, Allen et al. (1998), Da Silva (2005); and Marin, Angelocci, Righi, and Centelhas (2005) have estimated a Kc value of 1.2 when the planting density is 5,000 plants ha-1 (spatial arrangement [A]), and Kc = 1.3 for 10,000 plants ha-1 (spatial arrangements [B] and [C]). Volumetric moisture dynamics in the soil profiles of arrangements [A], [B] and [C] revealed variations both vertically along the profile and across evaluated periods. The latter corresponded to the dry (July - August - September) and rainy (October-November) seasons of 2015 (Figure 2). Figure 2. Volumetric soil moisture at 10, 20, 30, 40 and 50 cm deep, as measured across coffee planting densities (6:00 a.m.). Respective distances between plants and rows: a. 1.0 m x 2.0 m [planting densityA]; b. 0.75 m x 1.40 m [planting density B]; c. 1.0 m x 1.0 m [planting density C]. The studied dry season covered July, August and September of 2015; while the rainy season comprised October and November of the same year. Research conducted at Naranjal Experimental Station (Chinchiná, Caldas-Colombia).Water deficit was defined as <30% volumetric soil moisture, and water excess as >50%. Planting density [A] exhibited moisture content differences at 10, 20 and 30 cm deep during both the dry and rainy seasons, but not at 40 and 50 cm. At 10 cm deep, soil moisture values oscillated between 14.1% and 27.8% during the dry season, and between 23.3% and 41.8% during the rainy season. At 20 cm, the values fluctuated between 24.3% and 48.5% during the dry season, and between 29.0% and 62.3% during the rainy period. At 30 cm, said fluctuation ranged between 36.7% and 68.9%, and between 33.5% and 71.6% during the dry and rainy periods, respectively. The 40 and 50 cm depths registered the highest soil moisture contents. At the former depth, respective value ranges of 56.3% - 79.8% and 59.0% - 74.8% were registered for the dry and rainy seasons; while at 50 cm they were 56.4% - 80.1% and 49.6% - 73.0% (Figure 2a). Planting density [B] exhibited soil moisture deficit at 10, 20 and 30 cm during the dry season, whereas the rainy season maintained optimal moisture conditions. Similar conditions were observed at 40 cm during both studied periods, while the 50 cm depth registered excessive moisture throughout the evaluation period (Figure 2b). Planting density [C] exhibited soil moisture changes at all depths along the vertical profile during both the dry and rainy seasons, the respective value ranges of which were: 10 cm deep, 14.4% - 24.8% (dry season) and 20.6% - 64.0% (rainy season); 20 cm, 16.3% - 36.7% and 17.8% - 46.3%; 30 cm, 17.6% - 48.3% and 30.4% - 79.4%; 40 cm, 45.3% - 62.1% and 32.4% - 73.6%; and 50 cm, 59.2% - 87.1% and 53.3% - 81.7% (Figure 2c). During the dry season, arrangement [A] entered water deficit with respect to the soil’s field capacity (60% vol) at 10 cm deep. Optimal moisture conditions were observed at 20 and 30 cm deep during both the dry and rainy seasons. In turn, excessive moisture conditions were recorded at 40 and 50 cm all along the experiment (Figure 2a). 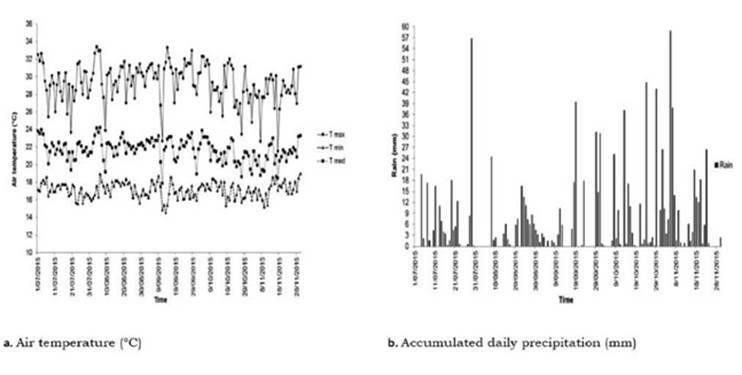 Unlike planting density [A], density [C] exhibited a similar behavior to that of density [B] in that it underwent moisture deficit at 10, 20 and 30 cm during the dry season, but attained optimum moisture conditions at those same depths during the rainy season. Excessive moisture was recorded at 40 and 50 cm during the two evaluated seasons (Figure 2c). Soil moisture in planting density [A] was found to be different at each of the studied depths, and to increase downwards along the vertical profile. The opposite was true in planting densities [B] and [C], where the moisture contents were similar along the first 30 cm layer, and lower values were generally observed with respect to planting density [A]. The cause of this behavior in soil water dynamics are elevated planting densities, namely [B] and [C], wherein root competition for space, water and nutrients is more intense. 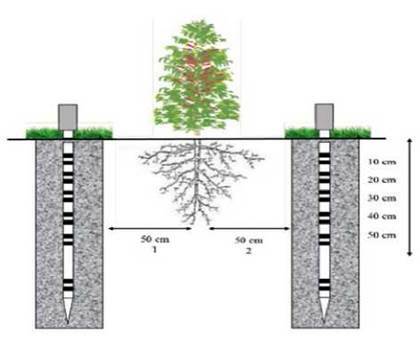 As a consequence, evapotranspiration by the plants forces the roots to delve through the profile in order to access water and thus meet plant requirements. On the other hand, planting density [A], which is significantly lower than the former, determines little competition between roots, resulting in higher moisture levels throughout the profile. Just as well, differential rain interception by the crop’s canopy across spatial arrangements affects the amount of water that reaches the soil and its moisture content. The vegetation acts as a barrier that intercepts and changes the effects and distribution of the rain (Jaramillo, 2005). Vegetation coverage in free exposure and shaded plantations is assumed to be 67.5% and 80.7%, respectively, the corresponding rain fall amounts that reach the ground being 92.4% and 85.7% (Velázquez et al., 2009). Based on the description of the soil profile at Naranjal Experimental Station (Hincapié, 2011), the soil horizons studied in the current work are known to be loamy, which are characterized by elevated moisture retention. Wang, Shao, Liu, and Warrington (2012) have found that soil moisture along the profile is influenced by vegetation type, transpiration and root distribution. In turn, Hincapié and Tobón (2012) state that ground slope in Andisols influences water movement throughout the profile, and Yang, Wei, Chen, Jia, and Mo (2012) have reported that the amount of moisture in the soil varies depending on water consumption by the plants. A study carried out by Hua and Shao (2014) on the perennial xerophyte Caragana korshinskii Kom., purple alfalfa (Medicago sativa), native plants and pearl millet (Pennisetum glaucum) allowed establishing that vegetation type has a profound effect on the dynamics of soil moisture along the vertical profile. These researchers observed that as water was consumed by evapotranspiration, the soil moisture content decreased. Garcia, Guerra and Hoogenboom (2009) found that efficient use of water by sweet corn (Zea mays L. var. Rugosa) was affected by weather variability within the season, and that soil moisture conditions depended on crop development stage. Furthermore, they established that the most pronounced moisture changes along the soil profile appeared to take place in the first 30 cm, due to increased evaporation. Said results agree with those obtained for coffee in the present study, wherein the lowest soil moisture values (recorded at 10, 20 and 30 cm deep) varied from the dry to the rainy season, thus correlating with precipitation (Poveda, Ramírez and Jaramillo, 2002). The trend that describes the behavior of soil moisture along the profile in the three studied planting densities allows identifying water recharge areas in which moisture displacement takes place through either capillarity or horizontal movement. In the upper horizons, said process goes from higher to lower water potential zones. For planting densities [A] and [C], the recharge zone was observed between 35 and 45 cm deep, and for density [B], from 40 to 50 cm (Figures 3a and 3b). 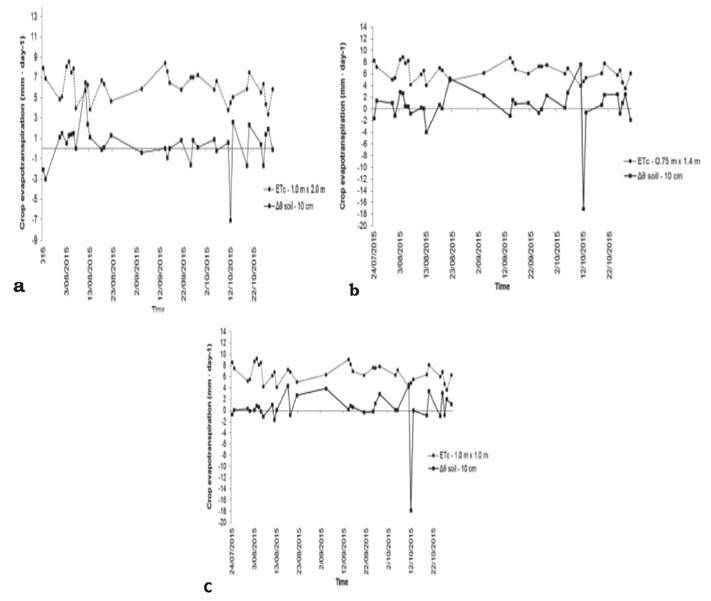 Figure 3 Volumetric soil moisture mean values and confidence intervals of three soil profiles from corresponding coffee planting densities featured by contrasting distances between plants and rows, respectively, as follows: 1.0 m x 2.0 m [planting density A]; 0.75 m x 1.40 m [planting density B]; and 1.0 m x 1.0 m [planting density C]. 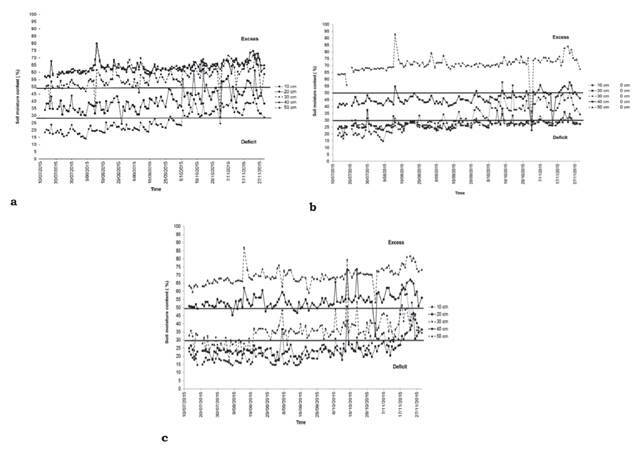 The data were obtained during the dry (a: July-August-September) and humid (b: October-November) periods. (Experiment conducted at Naranjal Experimental Station, Chinchiná, Caldas- Colombia). The highest values of volumetric soil moisture along the profile were observed in planting density [A], due to its low number of plants per area unit (5000 plants ha-1) and low real evapotranspiration of the crop (humidity changes from 6:00 am to 5:00 pm, corresponding to the value A0) (Figure 4a). This situation indirectly promotes plant development because moisture influences the activity of the microorganisms responsible for nutrient breakdown toward forms that are available for the plant (Obso, 2006). Planting density [C] (10,000 plants ha-1), had the same soil moisture behavior as planting density [A], although it exhibited lower humidity values due to its elevated evapotranspiration rate and increased water consumption (Figure 4b). This higher hydric demand is satisfied through increased root development, which, in turn, leads to water intake in deeper horizons (Cassidy and Kumar, 1984). Planting density [B] exhibited the lowest soil moisture values throughout the profile due to the elevated evapotranspiration rate of its 9,500 plants ha-1 and its increased water evaporation from the soil, which resulted, in turn, from longer distances between rows (1.40 m) (Figure 4c). However, this situation may not limit plant growth potential because of the efficient water loss control performed by the stomata and leathery consistence of coffee leaves (Rodríguez et al., 2001). Arrangements [A], [B] and [C] registered respective bulk density values of 0.64, 0.67, and 0.68 g cm-3, with corresponding coefficients of variation of 7.21, 4.53 and 4.12%; real density scores of 2.16, 2.15 and 2.16 g cm-3, with corresponding coefficients of variation of 6.16, 5.18 and 4.97%; and soil porosity counts of 70, 68 and 68%, with coefficients of variation of 1.64, 1.75 and 1.80%. The obtained bulk density, real density and porosity results of this study are similar to those reported by Hincapié (2011), who recorded bulk density values ranging from 0.57 to 0.86 g cm-3 in the soils of Naranjal Experimental Station. This author further notes that the low bulk density scores of these soils indicate an elevated porosity (> 60 %), as ratified by Prijono and Bana (2015). Also coinciding with the current data. Suárez et al. (1994) and González (2013) have stated that Andisols (and specifically those of the region of Chinchiná, where Naranjal experimental station is located, are characterized by low bulk density and high levels of moisture retention, porosity and organic matter content. During the evaluated period, and for the planting densities in question, ETo (as calculated through the Penman-Monteith equation) was found to be lower than crop evapotranspiration. During the dry season, the respective average, maximum and minimum ETo values were 4.5, 7.1 and 1.21 mm day-1, whereas during the rainy season they were 4.0, 6.23 and 0.5 mm day-1. The respective average, maximum and minimum ETc values of planting density [A] were 5.4, 8.5 and 1.4 mm day-1 during the dry season, and 4.8, 7.47 and 0.59 mm day-1during the rainy season. In the case of planting densities [B] and [C], the respective average, maximum and minimum ETc values were 5.88, 9.25 and 1.5 mm day-1 during the dry season, and 5.21, 8.10 and 0.64 mm day-1 during the rainy season (Figure 5). Approximately 35% of coffee evapotranspiration was found to correspond to evaporation, and 65% to transpiration. Thus, the respective standard evaporation and transpiration fractions of ET were estimated at 5.44 and 2.06 mm day-1; while those of ETc were estimated at 5.6 and 2.4 mm day-1 (Flumignan, Teixeira de Faria and Cavenaghi, 2011). Jaramillo (2006) estimates the extreme ETo values of the Colombian coffee zone at 2.91 and 3.9 mm day- 1, the most frequent count being 3.3 mm day-1. Studies by Da Silva et al. (2013) on sugarcane (a C4 plant) grown in tropical conditions have determined that ETc ranges between 2.7 mm day-1 (dryland conditions) and 4.2 mm day-1 (under irrigation). Figure 5 Reference evapotranspiration (ETo) and crop evapotranspiration (ETc) as measured in different coffee planting densities featured by contrasting distances between plants and rows, respectively, as follows: 1.0 m x 2.0 m [planting density A]; 0.75 m x 1.40 m [planting density B]; and 1.0 m x 1.0 m [planting density C]. Data taken at Naranjal Experimental Station (Chinchiná, Caldas-Colombia), during the dry (July- August-September) and rainy (October- November) seasons of 2015. In the three planting densities analyzed in the current study, the higher atmospheric demands of the dry season determined larger ETo values than those observed during the rainy season (Figures 6a and 6b). The same trend was observed for ETc, planting density [A] exhibiting the lowest records with respect to the other densities. Figure 6 Climatic conditions between July 13 and November 30 of 2015. a. Air temperature (°C). b. Accumulated daily precipitation (mm). Naranjal Experimental Station (Chinchiná, Caldas-Colombia). Accumulated ET reached a value of 503.23 mm between July 13 and November 30, 2015. During the same time period, the accumulated ETc values for planting densities [A], [B] and [C] were 609.7, 660.6 and 660.6 mm, respectively (Figure 7), while precipitation was 786 mm (Figure 5b). The volumetric soil moisture changes at 10, 20, 30, 40 and 50 cm deep (measured as differences between the 6:00 am and the 5:00 pm records) are considered to be the crop’s actual ETo. During the dry season, these values were almost always (98% of all measurements) below ETc as calculated by the Penman Monteith equation. However, some increases were recorded when the soil profile water dynamics led to water gain instead of loss (Figures 4 and 8). Thus, the available water in the soil profile allows coffee plants established in different planting densities to produce new biomass, even in periods in which the contribution from precipitation is reduced. Figure 7 Cumulative reference (ETo) and crop (ETc) evapotranspiration data from different coffee planting densities featured by contrasting distances between plants and rows, respectively, as follows: 1.0 m x 2.0 m [planting density A]; 0.75 m x 1.40 m [planting density B]; and 1.0 m x 1.0 m [planting density C]. Data measured at Naranjal Experimental Station (Chinchiná, Caldas-Colombia) during the dry (July - August - September) and rainy (October - November) seasons of 2015. 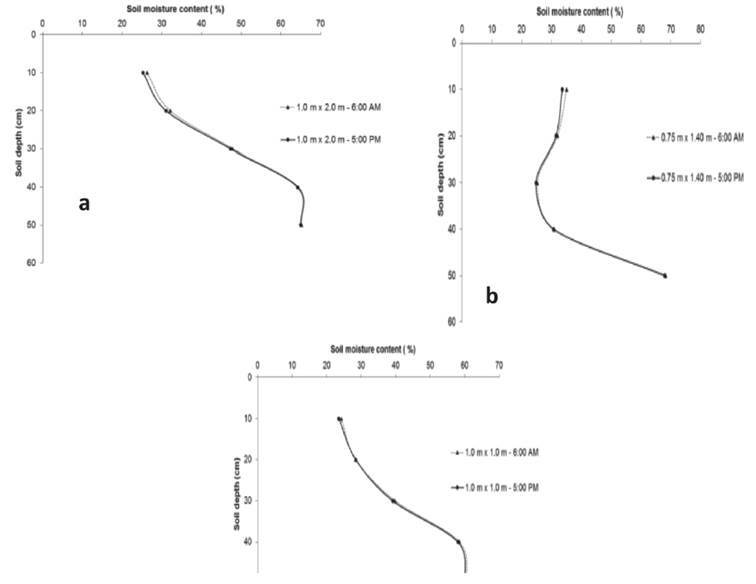 Figure 8 Calculated crop evapotranspiration (ETc) and changes in volumetric soil moisture (Ae) at 10 cm deep in three coffee planting densities featured by contrasting distances between plants and rows, respectively: 1.0 m x 2.0 m [planting density A]; 0.75 m x 1.40 m [planting density B]; and 1.0 m x 1.0 m [planting density C]. Data taken at Naranjal Experimental Station (Chinchiná, Caldas- Colombia) during the dry (July - August - September) and rainy (October-November) seasons of 2015. Soil moisture plays an important role in the management of a coffee plantation. Practices such as the definition of the production system (sun-shade), planting season, fertilization, phytosanitary management and planting density depend on, or modify, soil water content, which in turn exerts an influence on crop evapotranspiration. Despite the many components that condition water transfer to the atmosphere, studies such as the current one shed some light on this relatively complex process by increasing available knowledge on the soil-plant-atmosphere interaction under specific place and time climatic conditions. The capacitance probe is an effective mean for moisture measurement in the soil profile. This technique conveys minimal disruption to the root zone, thus constituting an interesting alternative for the hydrodynamic characterization of coffee planted areas in Colombia. Moisture content in the studied Andisol soil profile was observed to vary with planting density and seasonal changes (dry to humid periods). Soil moisture content showed the same pattern of behavior under the three planting densities, but varied across soil depths. Planting density [B] (9,500 plants ha-1) proved to be more susceptible to reduced rainfall due to its elevated soil water evaporation records, which resulted, in turn, from its longer distance between rows and, probably, from intense root competition for water. While ETo was found to depend on seasonal atmospheric conditions, ETc was affected by both planting density and seasonal atmospheric conditions. Both evapotranspiration parameters exhibited higher values during the dry season, when compared to those of the rainy season. The authors want to express their gratitude to the Colombian National Federation of Coffee Growers (Federación Nacional de Cafeteros de Colombia) and the National Coffee Research Center (Centro Nacional de Investigaciones de Café - Cenicafé), for financial support granted to the present research and for the consulting service and varied contributions of their scientific research staff.